Problem: Board meeting times are inconvenient for taxpayers, and technology goes unused that could broadcast meetings. Solutions: I would start discussion to move the Board of Supervisor’s regular meeting back to 5:30pm. The Board’s decision in the Summer of 2013 to change the regular meeting to 5:00pm has made it impossible for those working 8-5 to attend. The Board utilizes the recording technology, that taxpayers have paid for, only during executive sessions. And, these sessions are closed to the public. At a minimum, each board meeting can be audio recorded and posted at the county website. Cameras and technology is readily available in the board room to webcast and record each Committee of the Whole and regular Board Meeting, as well. Problem: A lower levy rate does not equal lower taxes. Rollbacks and taxable values complicate the public’s understanding. Solution: I will use every opportunity to explain how property assessment, the State rollback, taxable rate and the levy rates work together. A statement that a levy rate has been lowered is not a statement that taxes have not increased. I want all taxpayers to know what arm of our government owns each process and where to go for an explanation, praise or complaint. Problem: Review and preparation before approving spending budgets, grant applications, resolutions, policies or agreements (especially those citing state or federal law) is imperative before important votes. 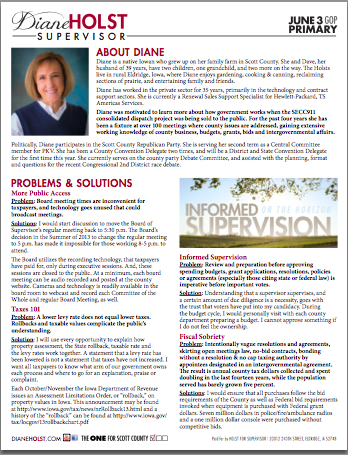 Solution: Understanding that a supervisor supervises, and a certain amount of due diligence is a necessity, goes with the trust that voters have put into my candidacy. 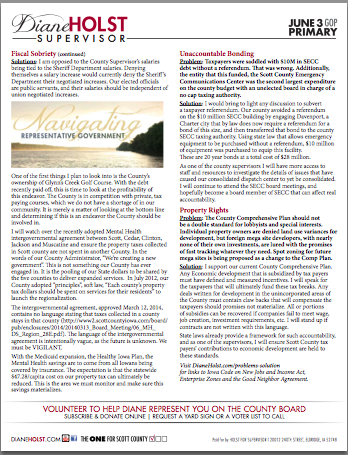 During the budget cycle, I would personally visit with each county department preparing a budget. I cannot approve something if I do not feel the ownership. Problem: Intentionally vague resolutions and agreements, skirting open meetings law, no-bid contracts, bonding without a resolution & no cap taxing authority by appointees designated in an intergovernmental agreement. The result is annual county tax dollars collected and spent doubling in the last fourteen years, while the population served has barely grown five percent. Solutions: I would ensure that all purchases follow the bid requirements of the County as well as Federal bid requirements invoked when equipment is purchased with Federal grant dollars. Seven million dollars in police/fire/ambulance radios and a one million dollar console were purchased without competitive bids. I am opposed to the County Supervisor’s salaries being tied to the Sheriff Department salaries. Denying themselves a salary increase would currently deny the Sheriff’s Department their negotiated increases. Our elected officials are public servants, and their salaries should be independent of union negotiated increases. With the 23 year debt for the County owned Glynn’s Creek Golf Course recently retired, now is the time to look at the profitability of this endeavor. The County is in competition with private, tax paying courses, which we do not have a shortage of in our community. It is merely a matter of looking at the bottom line and determining if this is an endeavor the County should be involved in. I will watch over the recently adopted Mental Health intergovernmental agreement between Scott, Cedar, Clinton, Jackson and Muscatine and ensure the property taxes collected in Scott county are not spent in another County. In the words of our County Administrator, “We’re creating a new government”. This is not something our County has ever engaged in. It is the pooling of our State dollars to be shared by the five counties to deliver expanded services. In July 2012, our County adopted “principles”, soft law, “Each county’s property tax dollars should be spent on services for their residents” to launch the regionalization. The intergovernmental agreement, approved March 12, 2014, contains no language stating that taxes collected in a county stays in that county http://www2.scottcountyiowa.com/board/pub/enclosures/2014/20140313_Board_Me…. The language of the intergovernmental agreement is Intentionally vague, as the future is unknown. We must be VIGILANT. With the Medicaid expansion, the Healthy Iowa Plan, the Mental Health savings are to come from all Iowans being covered by insurance. The expectation is that the statewide $47.28/capita cost on our property tax can ultimately be reduced. This is the area we must monitor and make sure this savings materializes. Problem: Taxpayers were saddled with $10M in SECC debt without a referendum. That was wrong. 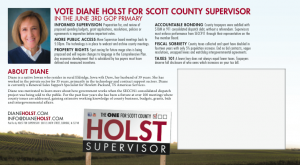 Additionally, the entity that this funded, the Scott County Emergency Communications Center was the second largest expenditure on the county budget, with an unelected board in charge of a no cap taxing authority. Solution: I would bring to light any discussion to subvert a taxpayer referrendum. Our county avoided a referendum on the $10 million SECC building by engaging Davenport, a Charter city that by law does now require a referendum for a bond of this size, and then transferred that bond to the county SECC taxing authority. Using state law that allows emergency equipment to be purchased without a referendum, $10 million of equipment was purchased to equip this facility. These are 20 year bonds at a total cost of $28 million. As one of the county supervisors I will have more access to staff and resources to investigate the details of issues that have caused our consolidated dispatch center to yet be consolidated. I will continue to attend the SECC board meetings, and hopefully become a board member of SECC that can affect real accountability. Problem: The County Comprehensive Plan should not be a double standard for lobbyists and special interests. Individual property owners are denied land use variances for development, but foreign mega site developers, with nearly none of their own investments, are lured with the promises of fast tracking whatever they need. Spot zoning for future mega sites is being proposed through zoning ordinance changes. Solution: I support our current Comprehensive Plan’s vision of protecting its farming heritage and preserving its agricultural land within the unincorporated areas. Any economic development that is subsidized by tax payers must have defined and measured incentives. I will speak for the taxpayers that will ultimately fund these tax breaks. Any deals written for development in the unincorporated areas of the County must contain claw backs that will compensate the taxpayers should promises not materialize. All or portions of subsidies can be recovered if companies fail to meet wage, job creation, investment requirements, etc. I will stand up if contracts are not written with this language. State laws already provide a framework for such accountability, and as one of the supervisors, I will ensure Scott County tax payers’ contributions to economic development are held to these standards.